My family and I are new to the Pomeranian Breeding business. We are located in Sand Springs, Oklahoma. We chose to call our Pomeranian Kennel Poms R Us. Of course we agreed. But none of us expected that day to arrive any time soon. My Great-Aunt Inez passed away December 28th, 2008. We took charge of her 'kids' as she called her Pomeranians at that time. It has taken alot of love and patience to win over their hearts. My Great-Aunt lived alone except her Pom kids. So these 12 new additions to our home were only used to one person taking care of them.... I'm sure it was a big difference to having four people who loved them uncondtionally. One of the pomeranians that we have of hers was pregnant at the time. We did not know this, as she and I had talked about Diamond and she said she was surprised that the pregnancy didn't take.... January 18th, 2009... Diamond welcomed 3 squirming puppies. 2 boys and a girl. Our Pomeranians are an unexpected blessing to our family. 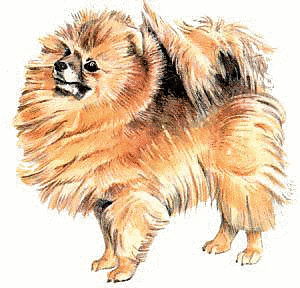 And we dedicate our business of raising wonderful Pomeranians in loving memory of Aunt Inez. At this time we do not offer shipping of our puppies.